Available on canvas only - Email us for more information. The Muse of creativity writes with nature Hir beautiful poetry, expressing the unity of love and beauty. This evening was especially delightful due to friends visiting and sharing the moment with us. I was teaching/sharing with them the techniques of "Sacred Sunset Photography" and we were all amazed by the magnificient splendor of the evenings dynamic colors. The ring of mountains around us glowed and sparkled. The western mountain peaks resembled images of ancient villages. Where ever you are, your life can experience this blessed event. Watch your sunset this evening with your family, loved ones and friends. A celestial gift awaits you. We guarantee product quality satisfaction. The Sunset photographic print sizes are 11 inches by 22 inches, or 8 inches by 12 inches. Our photographic sunset prints are mounted on acid free, double matt board. Or a Medium Black, 14 inch by 18 inch metal frame ready to hang. 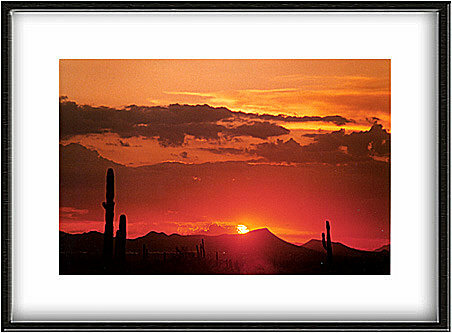 Orders for our Framed Sunset Photographic Prints will be custom made when we receive your order. We require full payment before we make your framed print. This process may take up to a few weeks depending on the photographic print and custom requirements. Shipping and handling costs for the framed prints will be discussed with you during this time.